That’s pretty much how I felt about having given up the comfort and safety of writing a series set in a city I know very well to instead come up with an entirely new set of characters in a place I’d never been to. Even worse – and yet in many ways better – it is set in a place far removed from the Glasgow that’s home to my Tony Winter/Rachel Narey series. Torshavn is the capital of the Faroes Islands, said to be the smallest capital city in the world with just 17,600 inhabitants. Buffeted by the harsh weathers of the North Atlantic, the people live in multi-coloured houses with turf roofs and most of them depend on the sea for a living. They eat whale and puffin, drink akvavit, enjoy endless summer days, endure long, dark winters and frequently have four seasons in an afternoon. They are said to have the lowest crime rate in the world and live in a landscape as dramatic as it is stunningly beautiful. Apart from the weather and the fact that they don’t/can’t grow vegetables, it’s all very unlike urban Glasgow. The more I learned about the place as I scouted for an overseas location as part of a planned Winter/Narey book, the more I knew I wanted to write something there. It just didn’t fit for my police photographer and detective sergeant so it had to be a standalone. New characters, new plot, new location. There was nothing else for it but to visit. In November 2012, I flew from Edinburgh to Amsterdam, to Copenhagen – it took eight hours before I got north of where I started – and then finally on the bumpy final leg to the Faroes and one of the world’s smallest and supposedly most dangerous airports to land at. I booked into the Hotel Torshavn for eight nights and endeavoured to learn as much as I could in that time. The people were just as friendly though and frequently someone would come up if I was sitting in a bar – which I had to do in the name of research – and start a conversation. 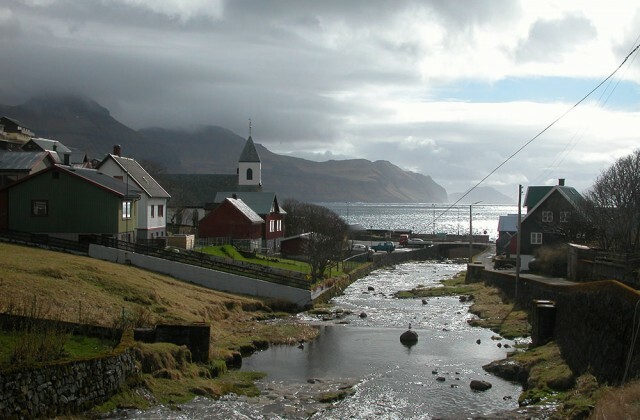 They were more than happy to talk about their town and the islands, sharing both the joys and hardships of living in the middle of a rain-lashed triangle between Iceland, Norway and Scotland. They generously gave me what I needed to write a book. They have a lot of weather in the Faroes, most of it wet. In those eight days there were two brief occasions when it didn’t rain – and it snowed instead. There was not a single moment when there wasn’t something falling from the sky. It felt like home. Obviously, much as I liked the place, I had to spoil the Faroe Islands’ crime figures. I felt a bit bad about doing so, even if it was only in the pages of a book. A crime novel without a crime just wouldn’t be right. So a place with only murder in 25 years had to have (at least) another one. And there’s quite a bit of blood spilled, not all of it human. Sorry about that.